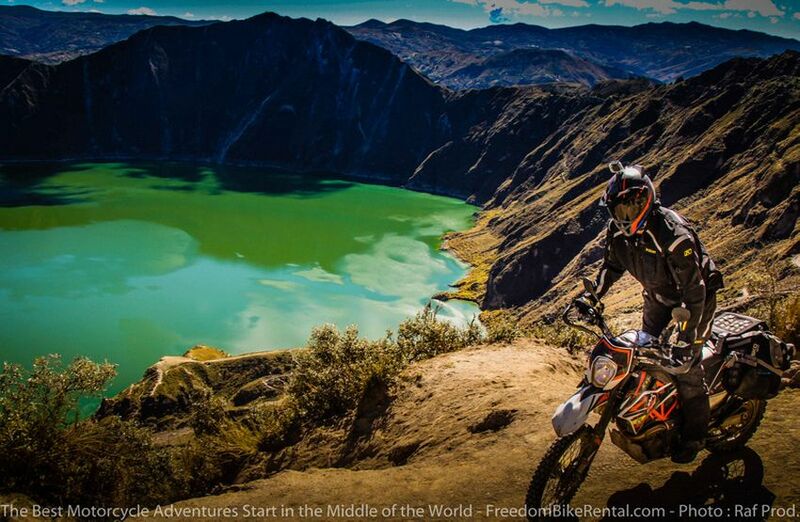 This 4-day tour will take you immediately out of the city of Quito onto dirt roads. First descending into the cloudforest and then rainforest on the western slopes of the Andes, the ride will gain and drop altitudes many times each day. It is a ride through stunning landscapes, small villages and in areas of the country that few people visit. There are several stops along the way to meet local farmers and people of many trades. You’ll begin your four day “Offroad Ecuador Tour" from our shop located in Quito, Ecuador - 2850 meters (almost 2 miles above sea level) in the Andes Mountains, on the Equator, in South America. In 1978, Quito became the first place on the planet to be designated as a UNESCO World Heritage Site for having the best-preserved historic center in all of Latin America. Quito is high on the Antiplano Plateau (the highest capital city in the world) in the Andes at 9,350 feet. We suggest that you arrive a day or two early to experience our magnificent capital city while getting acclimated to high altitude before beginning the tour. We'll provide you wtih tickets to the double-decker "hop-on / hop off" bus that will show you the best sights in the city. On the morning of the tour departure, you’ll be outfitted with the offroad motorcycle of your choice and given a thoughtful presentation that will answer all your questions concerning local customs, rules of the road, riding signals, etc. We will ride out of Quito, avoiding any suburban sprawl and immediately begin riding on a dirt road that will take us first to a chilly highland pampa mountain pass and then through fertile farmlands, beginning our curvy descent into the lowlands of Santo Domingo Province. We will be passing by several spectacular waterfalls as we ride through small villages such as Chiriboga and other settlements in the cloudforest on the western slopes of Ecuador. Once down to about 3,000 feet in altitude, we will be in warm, humid air - quite a change in climate from where we started just a little while ago in Quito. We will have a chance here to stop for a swim in natural basins formed by waterfalls. We will get back on the bikes refreshed and regenerated by the mountain waters. We will begin a climb that will last until the end of the day. We'll tackle some steep switchbacks that will take us up for tremendous vistas over the valley below. Then passing after passing through dense jungles and green pastures, we arrive in the small town of San Francisco de las Pampas to have a great lunch of simple, but delicious, local cuisine and to chat with the townspeople. We will continue on (sometimes) challenging dirt roads, climbing in altitude to over 11,400 feet, passing picturesque farmlands, cloudforest, and high moorlands before arriving in the town of Sigchos, a town settled in the 1500's by the colonial Spanish. In Sigchos we will now officially be on the famous "Quilotoa Loop" and will continue past some astonishing scenery and farmlands before arriving at Mama Hilda's in Chugchilan. Here you find a private cozy room with a wood stove and a family-style dinner of pots and pots of Ecuadorian food that will replenish you after a full day of riding. You will surely fall asleep as soon as your head hits the pillow. After a hearty breakfast at Mama Hilda's we will head out of the charming mountain town of Chugchilan and after another blissful ride on stunning dirt roads along deep canyons, we will arrive at the awe-inspiring Quilotoa Crater Lake, which was formed after a catastrophic volcanic eruption about 800 years ago. The lake has a beautiful aqua-blue color to it that is unique, due to the mineral content. Then we will ride to Zumbahua on a recently paved road that will give us great views of a fertile valley. Zumbahua is a farming town with a central market square. We usually stop here for a "second breakfast" of fresh hand made empanadas and local fried pototoes. The snack will give us an energy boost that we will need as we head up and into chilly air. After Zumbahua, we will once again be on unpaved dirt roads through some of the most picturesque regions of Ecuador. We will rise into highlands pampa, where wild alpacas and llamas roam free. We'll maintain an altitude of about 13,400 feet for a while. The people who live at this altitude have kept their traditional ways. Many live in mud homes called "chozas" that have thatched roofs. Inside they cook in fireplaces without a chimney to seal their homes from rain. Here they herd sheep, grow potatoes and live a simple life in a spectacularly beautiful place. We will pass through the quaint, charming little town of Angamarca. which is known for its wood carvings and visit with the local craftsmen. Then continuing along to the next hamlet of Shuyo, we visit a working water mill where they process grains using techniques that are centuries old. We'll have a chance to visit a guinea pig and rabbit farm as well as visit with a local school as part of our "Pack for a Purpose" program. From here, we continue to descend into the subtropical climate and into the town of El Corazon - where they brew and bottle their own unique brand of moonshine - a flavored alcohol that is quite good yet inexpensive. El Corazon is a very friendly town and a good place to stop for lunch. We'll have a tour of one of the moonshine distilleries and get a taste for the local firewater. From El Corazon, we will again face some challenging dirt roads that wind through thick jungles and arrive in the colorful, isolated village of Facundo Vela, a place that seems like it hasn't changed much in the past 100 years. The town is usually full of horses with not a single car to be seen. You will feel as though you have ridden into a time warp. Facundo Vela is known for the marmalades the local nuns make by hand to fund their school. We'll watch them stir this succulent concoction with big, wooden spoons in large hand-made copper pans. You'll want to bring a jar of this back home with you for a time when you'll enjoy breakfast thinking about this ride. You will be glad you did. Taking the dirt road out of Facundo Vela, we continue to ride and gain altitude on a series of steep switchback cobblestone trails. The air through this section of cloudforest is scented with wild orchids and tropical plants. The air through this section of cloudforest is scented with wild orchids and tropical plants., then the air turns cooler and the scents change to those of pine and eucalyptus as you climb higher. We will cross a high mountain pass at 13,400 feet before arriving in the village of Salinas de Guaranda. This town is unique in Ecuador as it has a Swiss heritage. Here they make chocolate and cheese in the Swiss tradition we will enjoy a good dinner at one of the local restaurants that uses the local cheese, hams, sausages and mushrooms that are produced here. We'll enjoy a good night's sleep at the new Cachi Yacu hotel. After yesterday's long ride (you will see how long 135 miles feels!) we will have time in the morning to visit the special town of Salinas de Guaranda. Every morning, the local farmers bring their milk in on donkeys, alpaca, motorcycle and horse to the cheese factory. We'll see how this milk is transformed into the highest quality cheeses such as Gruyere, Emmental, Tilsit and Gouda. Then we will visit the chocolate factory which uses only the highest quality locally grown cacao to make truffles and chocolate bars that rival anything that Godiva can make. The chocolates are gaining popularity around the world. We'll also visit the local craftsmen that make soccer balls by hand. And we will witness how sheep and alpaca are sheered and their wool transformed into yarn using 100 year-old machinery brought in from the former mills of Massachusetts in the USA. We'll head back onto the bikes, taking a dirt road that will bring us through breathtaking high altitude paramo - with crystal waterfalls. We'll ride for a while along a high ravine overlooking the western slopes with expansive views over the coastal plains. We'll stop in the hamlet of Arrayanes, population 87. The townspeople here work together to make a cheese called "Andino" which is savory, buttery and slightly sharp. We'll get one of the rounds of cheese and carry it for a snack in the saddlebags. We'll continue down through several sets of switchbacks, with each turn giving us tremendous vistas. We'll ride past towering 300 feet waterfalls and through other friendly villages. We'll begin to see mandarin orange trees, sugar cane, and exotic fruits growing along roaring whitewater rivers. We'll ride through the towns of San Luis and continue our descent to sea level. Here we will be treated to long rolling hills that make it seem we are on an extended motocross track through a garden. We will smell the aroma of cacao drying in the sun, and see the beautiful palm groves that are magical. We will end the day in the city of Quevedo. Quevedo was the first Chinese settlement community in Ecuador and many of the Chinese restaurants date back to the 1920's and is known as Ecuador's "Chinatown." We will enjoy a bountiful Chinese dinner before settling into the comfortable Hotel Olimpico for the night. From Quevedo we will climb back into the tropical rainforest region; first passing grand palm, banana and cacao plantations and then into coffee country. We'll stop in Pucuyacu - which has a local animal and farmer's market. From Pucuyacu, we will do a river crossing and then begin the steepest climbs you will have ever seen. We climb over 6,000 feet in just 4 miles. Again, you will be blown away by the views we get along this road. We will cross back into the town of Sigchos, which we passed on "Day 1" and finish riding the scenic "Quilotoa Loop" riding amazing roads of cobblestone with tremendous vistas in all directions. We'll go through the village of Isinlivi, which has an ancient indigenous pucará - a mound and fortress built in a strategic place. Isilivi is known for its carpenters, woodworkers and they make exquisite wood carved doors and statues. From here, we will climb again to go over the Guingopana Pass - here we'll get a view of snow capped volcanoes before we head down a twisty cobbled road and through the farming town of Toacaso. Then we will pass several farms that produce roses and other cut flowers -one of Ecuador's major exports. We will pass the famous market town of Saquisili (and stop there if it is a market day) and continue onto the Panamerican Highway, also known as the "Avenue of Volcanoes". We will stop for a final meal with your riding companions at the famous Cafe de la Vaca before heading into Quito with a great adventure to tell your friends about. This guided adventure tour will start in our offices located in the Carolina neighborhood of Quito, the safest and most convenient part of Quito. On the morning of our departure you will receive a detailed and thoughtful presentation on Ecuadorian rules of the road, customs, courtesies and group riding guidelines. On the morning of departure, you will be provided the offroad-capable motorcycle of your choice which is fitted with waterproof luggage system and a tankbag if you want one. If there are more than five riders on the tour, a support truck will be available to carry your luggage and will carry bottled water. The support truck is not intended to be a rest vehicle if you do not feel like riding - it is able to respond in an emergency and to make your ride more comfortable. If there are fewer than five riders on the tour, we may not provide a support truck and you will need to carry your gear in the saddlebags or luggage system provided with your bike. The route you will follow over the next four days is based on several years' of experience and riding these routes many times. Your guide knows the route thoroughly, having ridden it several times before. The route is not highly technical and is composed primarily of unimproved dirt roads (natural dirt roads without gravel,etc). The Guide will make many stops throughout the day to introduce you to the locals, explain the local history and show you "hidden gems" that are not common knowledge. Weather and temperature ranges in Ecuador are generally the same year round. In the highlands, you can expect the chance of passing showers but rarely a full day of rain. Chances for a full day of rain are more likely on the western slopes of the Andes in March, April and early May. This ride will be in elevations of sea level where temperatures can be around 90 degrees fahrenheit to 13,500 where temperatures are in the 30's fahrenheit. Dressing in layers is recommended. Plese see this article for more nformation about the weather in Ecuador. Throughout the tour, we will stay in ideally-located, comfortable and clean accommodations. See this page for details and links to the accommodations provided. Ecuador Freedom has the right to substitute accommodations of equal quality due to availability and will notify you of these changes. Our accommodations are selected for their exceptional quality, location, and uniaue character. Below are the accommodations featured on this tour. Single occupancy hotel rooms are standard (best botel in town) - your own private room each night! VIP access to the Freedom After-Ride Lounge™ with hot shower, jacuzzi, and wet bar.